Last time, I talked a bit about just how genre-defining and genre-redefining Resident Evil was for its time, as well as how it landed just as I was beginning to feel "old enough" to play horror games. Having loved the novelization of the first, I'd become a strange sort of fringe fan, a fan of the setting and its characters without having actually played the original game...but already I was rabidly consuming everything I knew about the upcoming sequel, reading every article in every gaming magazine and moving on to the strategy guides as they landed on Barnes and Noble shelves. Reading video game guidebooks, primarily for the bestiaries, was actually one of my favorite activities growing up, whether or not I had ever played or would ever play the game in question. For this game, however, I was ready. Resident Evil 2 seemed like such a big deal at the time, so cool, so vast, so scary that just renting it from Blockbuster felt like something uniquely exciting, and all its stilted dialog and dated animation felt like the absolute cutting edge of electronic entertainment. I can't even tell you how it felt to play this game for the first time without a single comparable experience beforehand. Story-heavy games still weren't the norm outside of the RPG genre, and horror games were only now taken more seriously in the wake of the original Resident Evil's smash success. I intend to leave virtually no stone unturned, here, so we're going to review even the most minor and forgotten creature in this entire game; the "giant" virus-infected roaches only barely exceeding the size of some natural, un-mutated Blattodea. 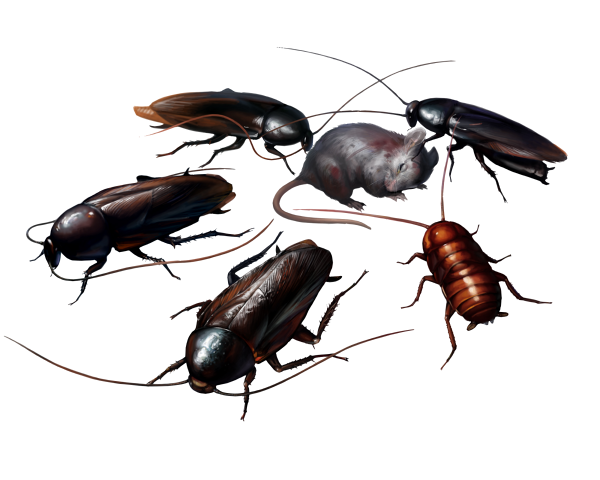 We encounter the roaches only briefly in the game, through maybe one or two sewage tunnels, and their inclusion was probably not necessary at all...but they're still among my favorite animals, and to me, every last creature they can cram into a video game feels as though it adds something. Every monster encounter doesn't have to be epic! 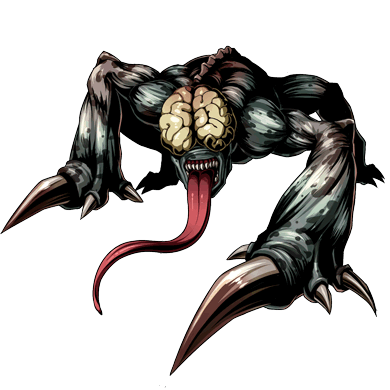 Though only introduced by the second game and seldom reappearing, the Licker is quite possibly the most famous monster in the Resident Evil franchise, and works well as an immediately recognizable "face" of the series. The first game had relatively few creatures distinctive enough to have functioned well as mascot material, but one look at a Licker and you know precisely what fictional universe you've stepped into...or close enough ripoff, I suppose. 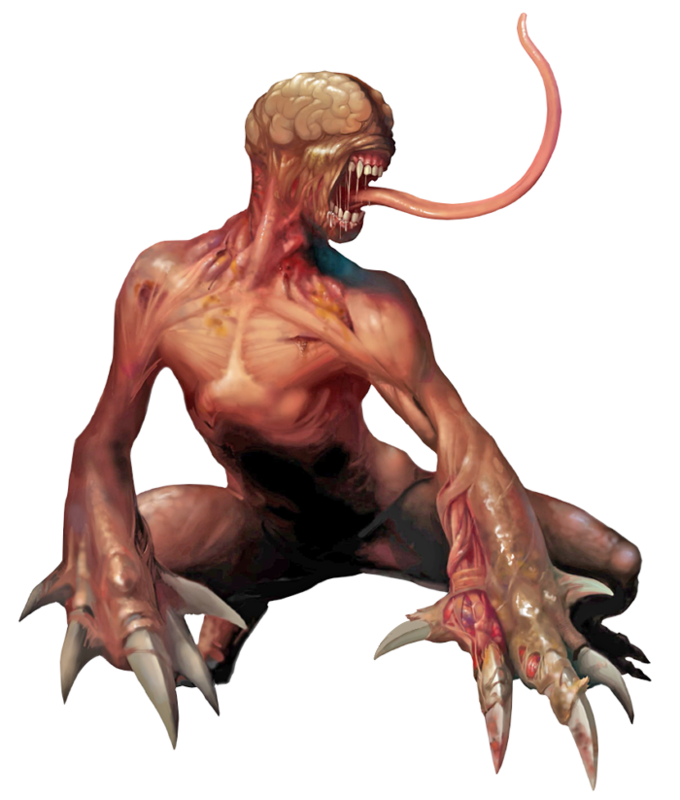 Details have varied over the years, but as far as we currently know, the Licker is what happens when the T-virus is "re awakened" from dormancy in a normal zombie, further mutating the former human into a very, very inhuman predator with huge, mole-like foreclaws, an exposed musculature, a face now dominated by a mouth alone, an externalized brain and the long, whiplike tongue for which the creature was named. How exactly it can cling so easily to walls and ceilings is never adequately explained, nor how that tongue is able to impale or even decapitate human prey like a steel cable, but a sticky-footed, semi-faceless mutant with a pulsing brain and killer tongue makes for what is simultaneously an extremely simple and unforgettably novel icon of horror gaming, fully deserving of its lasting fame. I especially love this original concept art, where the mouth is even bigger and the brain is a prominent, fatty yellow affair! I do wish they'd kept a little bit closer to this for the final design. Later in the game, we even encounter "further evolved" lickers, now in cooler shades of blue-green and with a single oversized talon on each arm, the rest of the digits apparently atrophied. 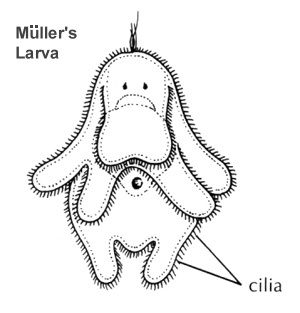 It's too bad this concept wasn't taken any further; it feels to me like this is still just a hint of things to come, like the Licker as we know it was only an awkward transitional stage toward something even more alien. Bigger, more powerful Lickers would crop up in the Resident Evil movies and later in the actual games, but little altered from the classic Licker, ignoring anything they might have been going for with the hook-toed reskin, which admittedly may have been some programmer's last-minute afterthought to toss in some extra variety. Obviously I picked up S.D. Perry's novelization of this game as well, and I always liked the detail that Sherry Birkin and Claire Redfield, not having access to Umbrella codenames, end up dubbing these monsters "the inside-out men!" Still one of my favorite things in the series! 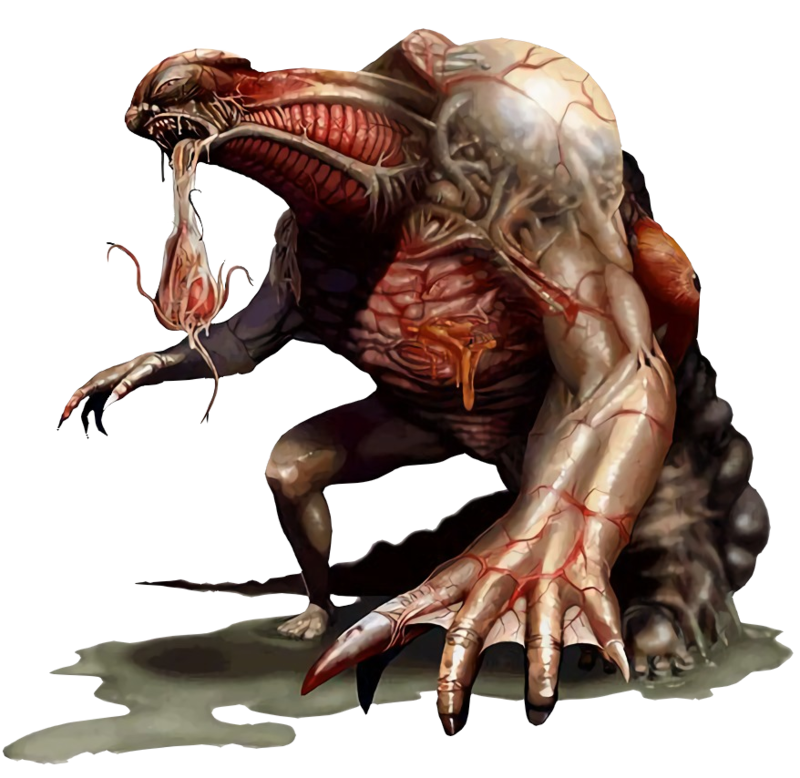 The "main" monster of this game, the mutated scientist William Birkin, implants parasitic embryos in human hosts in an attempt to self-perpetuate, but incompatible hosts apparently result in obscene failures like this slobbering abomination, which always made me think of some sort of giant, skinless, fetal ground sloth. I love that ghastly, miserable E.T. sort of face it has on that distended, veiny neck, not to mention is grossly mis-matched limbs! You can really see how unstable and just awful the G was intended to be from its conceptual sketch. It appears to have either had a vestigial human face remaining on one shoulder, or I'm just reading some of its pustules and sores all wrong, but the fact that I'm not certain only emphasizes how lovable putrid the "G" really is. Look at all that stuff just spurting from this poor wreck! And only now, after all these years, do I realize just how much its head was meant to look like a horrendously magnified phallus. There's such a classic Japanese Body Horror feel to the G-mutant, like the ending of Akira or any number of other grisly mutations in 90's anime, and I feel like it remains one of the series less respected, under-appreciated denizens. It's a barfing, leaking, decomposing dicksloth. A horrendously tragic mutation that clearly communicates its "failed" nature while still looking pretty damn dangerous. Best of all? The G-mutant's primary mode of attack is that it constantly spits up THESE precious babies. What an absolutely perfect boss fight, lovingly formulated to exemplify for the player just what sort of screwed-up evil science we're dealing with here. This was actually one of my favorites as a kid. I was going through some sort of "moth phase" at the time, even ranking Venomoth as my second or third favorite Pokemon and collecting anything to do with scary, monster moths from our own humble Mothman to Kaiju like Battra. 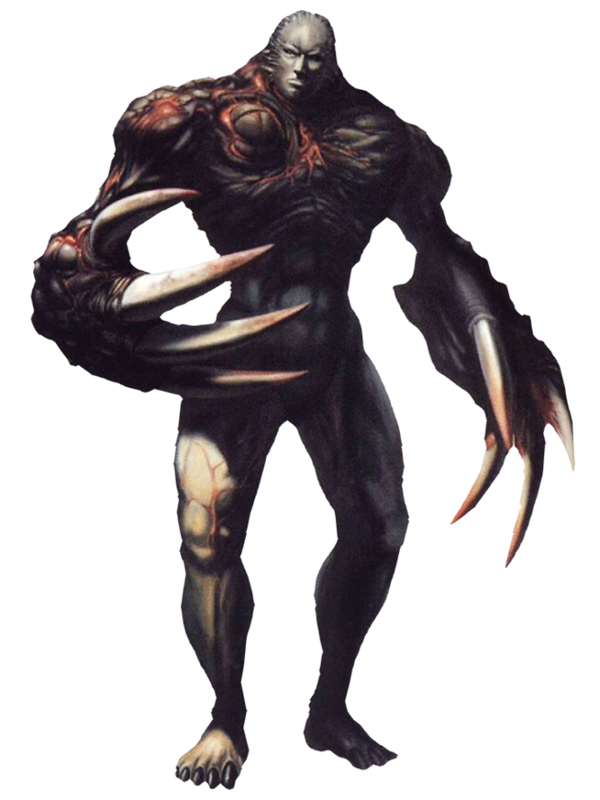 Then Resident Evil 2 hits, and of all the arthropods they could have included as giant-size mutants, they go with a moth. Superb timing! It's such a beautiful moth, too, supposedly derived from Lymantria dispar dispar, a notoriously invasive species insensitively known to many as the "Gypsy moth," though the color patterns we're seeing would indicate a male of the species, and this moth is encountered with a cluster of eggs and squirming, maggot-like larvae! There's also only one of these moths in the entire game, despite not being especially powerful or dangerous, and I like that in the same way I like the limited range of the Chimeras from the first game or the roaches we only just talked about. The moth isn't a "boss" or even a very effective biological weapon, but its inclusion adds more overall character to the game, and to me, there's always been a strangely eerie feeling to such inoccuous animals blown up to abnormal dimensions. An almost psychedelic, Alice-in-Wonderland kind of vibe to go along with all this grislier gore and death. THE IVY, or "PLANT 43"
MY BABY!!! This was the monster I fell in love with as a teen across both games, and continued to be my favorite for several installments to come. At the time, I found "multi-petaled" mouths to be the coolest possible look for any creature, to the point that I burnt myself out on them and have since used them only very, very sparingly in my own designs. I still think the effect is in top form here, as the uncannily humanoid body of this shambling plant just immediately gives way to those three massive, toothless flaps exactly where a head and face should be. I don't think we ever got any confirmation as to whether these things incorporate a human element, but they sure do look like it. Even the way they walk adds to the atmosphere; an easygoing, sleepy sort of gait until they're close enough to close those fat, fleshy petals over your head and dissolve it clean off of your shoulders, reminding us why all the snarly fangs in the world are never quite so alarming as something gunning for you with no teeth. Official documentation also mentions that these creatures are able to move by vigorously pumping water throughout their bodies, like an echinoderm on land! A very cool and believable detail. These guys really did some homework. "Ivy" even comes in a "poison" variant, because of course it does, with knockout-gas breath and a simply spectacular color scheme. 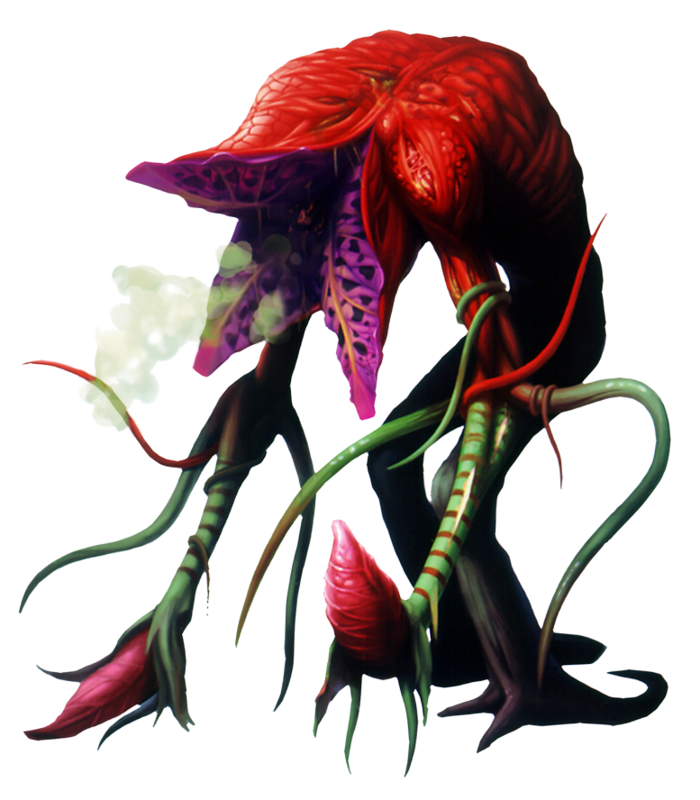 We really haven't seen many plant creatures in Resident Evil since these sweeties, have we? 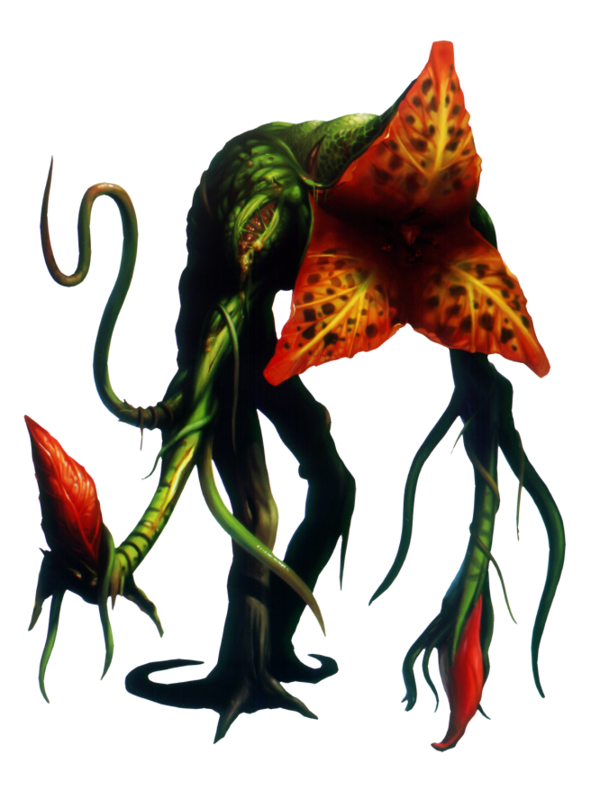 There are both carnivorous plants and plant zombies featured in the later Outbreak, but I feel like plants are kind of critically untapped for the theme of an entire entry. We've since had a nautical Resident Evil and a Resident Evil dominated by insect-based mutants. Where's our Resident Evil: Little Shop of Triffids? I have to confess, unfortunately, that I never actually completed Resident Evil 2. As my first survival horror, I found the game a monumental challenge to get through with even one character, Claire, and then I was expected to start over with Leon to finish the story...and it was still all on a single Blockbuster rental. 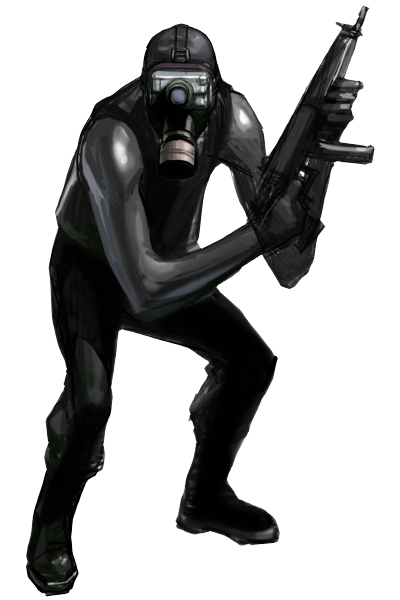 Had I actually played Leon's scenario, I'd have had to deal with the mysterious Mr. X, a large, strong, silent, and seemingly unkillable man in a trench coat sent by Umbrella corporation as their ultimate retrieval unit. It wasn't a design or concept I found exceptionally cool at the time, but I can appreciate "Mr. X's" subtler, Frankenstein's Monster kind of scariness, though that subtlety doesn't last long. It eventually turns out that the trench coat is a mutation inhibitor to keep this "Super Tyrant" under control, and without it, it reverts to the kind of monster we're more accustomed to battling. 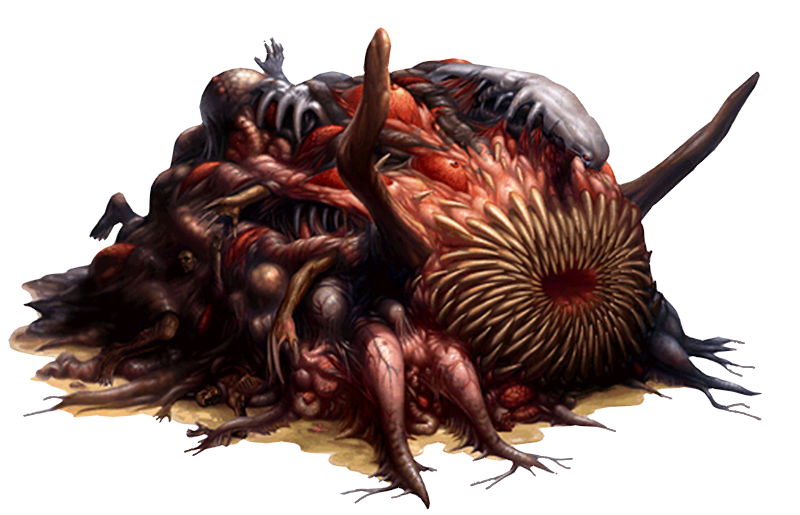 Before we cover our last monster, here's a weird one many people forget all about, namely because it can only be encountered in a post-game bonus scenario. These beings are sent by Umbrella corporation in large squads to eliminate any remaining witnesses to their villainy, and are apparently intelligent enough to follow complex orders. You can tell their proportions aren't quite human, however, even just from this artwork, and in fact, they're of a more monkey-like stature in action, leaping and somersaulting and gibbering and screeching, which is quite a bit freaky coming from something covered head to toe in stealth gear and some sort of high-tech gas mask. 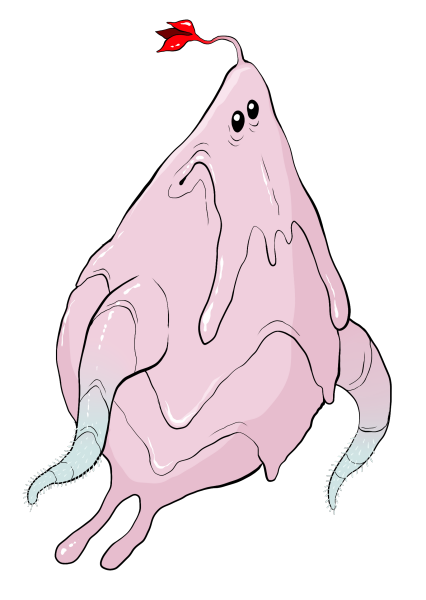 We never find out what the heck is under those outfits at all, especially because they immediately dissolve when killed, and it really makes for one of the most intriguing creatures in the series. It's a shame we never see a whole lot more of them. 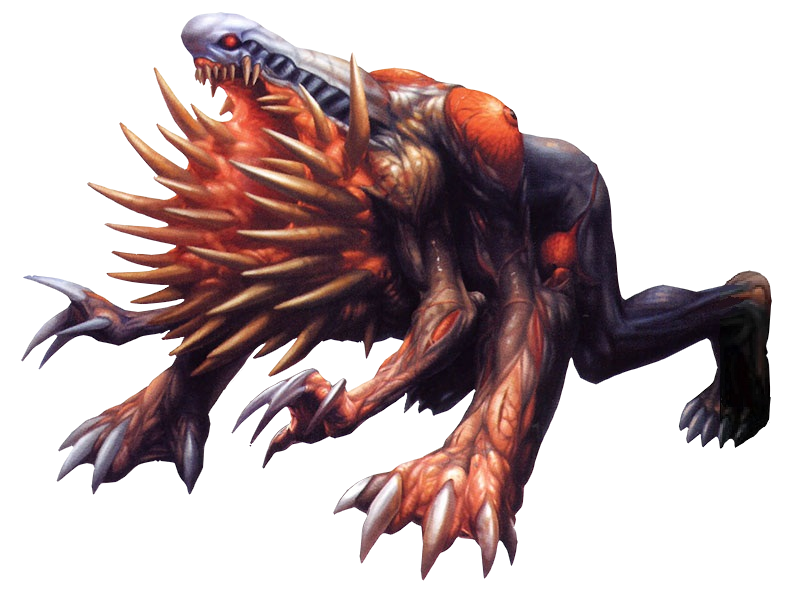 Finally, we have what's more or less the true star of the Resident Evil 2 bestiary and the very cause of the game's massive monster outbreak. Not long before the game begins, the very developer of the ultra-potent Golgotha Virus is mistakenly gunned down by military operatives during a botched deal with Umbrella, and uses his final moments to inject himself with the entire known supply of his beloved creation, knowing it will save him from death above all else. By the time we see him, he's already too far gone to retain much of his human memories, and sports a single massive eyeball erupting from his torso. This being is officially known only a the "G," not to be confused with the G-mutant created when "G" injects a parasitic embryo into the wrong host. Disturbingly enough, in fact very, very, very disturbingly, the "right" host for G's parasites is apparently anyone genetically related to his original, human form, and he is compelled to stalk his own young daughter, Sherry, who has no idea her own father now mindlessly seeks to implant her with a mutant embryo and subsequently transform her into an equally powerful or more powerful monstrosity. 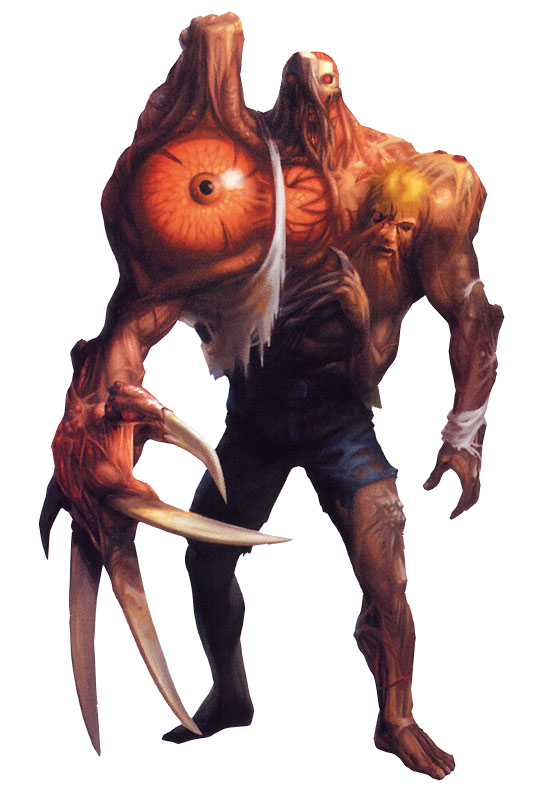 Birkin's second form is by far his most famous, second only to the Licker as a "mascot" of the second game. The big, squishy eyeball is emphasized even more, and his original face has degenerated to make way for a new head that's little more than a crude, gristly stump! The novel offers a lovely description of Birkin actually taking on this form, the new head erupting from his flesh as the original head deflates "like a bad stop-motion effect." I really wish the eyeball had just kept getting bigger and bigger, but at least there's a new little one bursting from Birkin's thigh, now. The lopsided slab-head has sorted itself out at this point, becoming a more formidable sort of demon-skull as the entire monster takes on a more powerful, more capable appearance. You can almost miss those final remnants of Billy's face, melting away into the torso with a look of confused rage. Birkin's physiology eventually takes an abrupt nosedive from an agile, muscular predator to an enormous, sedentary mound of tumorous flesh and absorbed bodies, the freudian head even less human and now much more separate from its massive, churning garbage disposal of a maw. 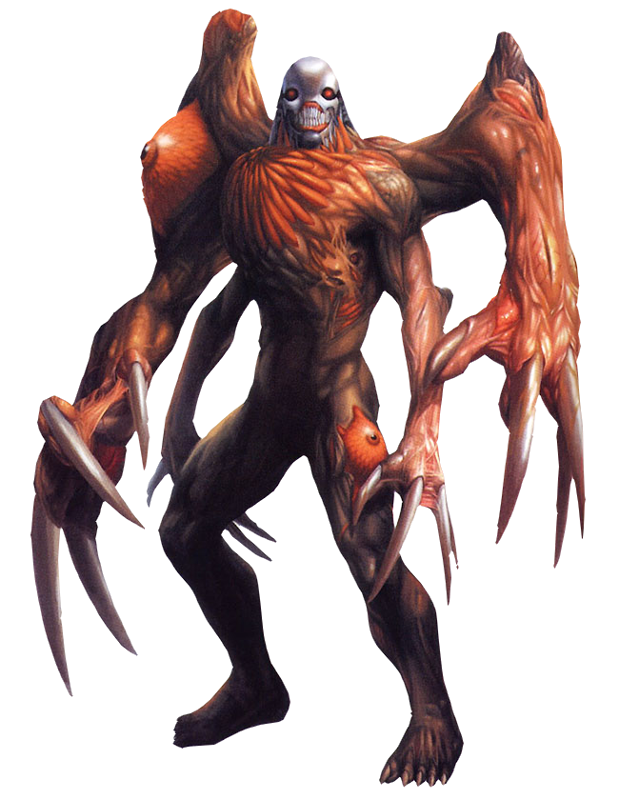 This is Birkin's "final form" only in the sense that he's subsequently destroyed. We still don't know how he might have just continued growing and changing, but we can assume it was going to be bad news for absolutely everybody. 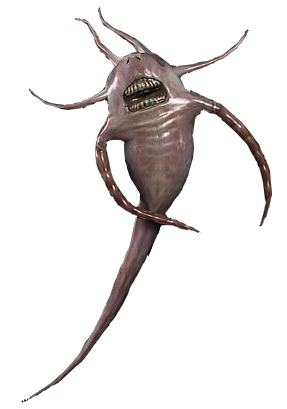 Delightfully, this progression to a deadlier and deadlier monster followed by a sort of "crash" into a cancerous blob would become a running theme among Resident Evil bosses, and while that does lose a bit of its magic the third or fourth time, the quality of Final Blobs is upheld pretty consistently. Birkin was a real trendsetter! Writing these reviews actually brought a faded memory bubbling back to the surface, and I'm going to share it with you now despite the fact that I'm not sure I can elegantly explain my original reasoning behind it. 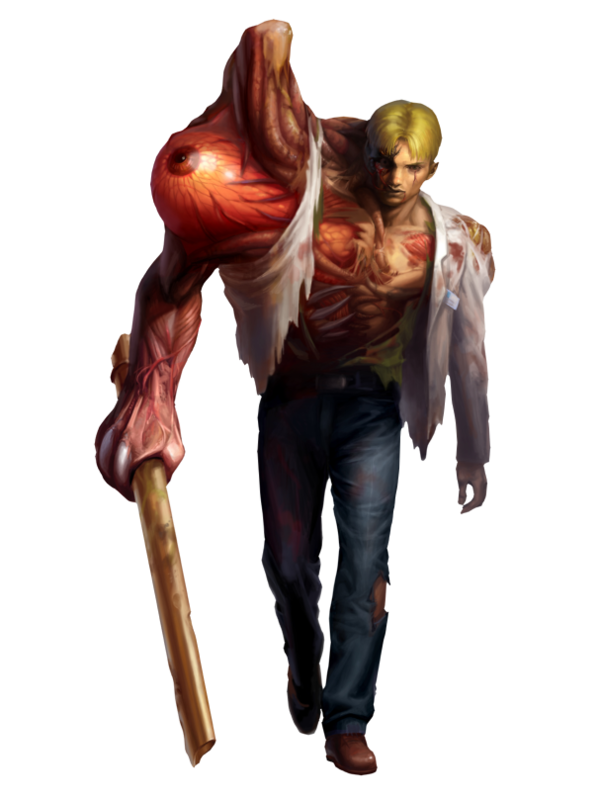 It was only natural that I'd have come up with a Resident Evil monster of my own back when I originally played this game as a young teen, but...it's really, really not the kind of thing you would expect. I mean, not even in the ballpark, the other ballpark a town over, or the secret ballpark on the moon. Yeah, uh, I don't know where I got the name from (sounds like "Mal Yoon") and I don't know if I remember what I based the design on exactly, but back in the day, I had an obsession with "Mario style" enemy aesthetics surpassing any obsession with gnarly mutant insects or slime-gushing aliens. I also had a special affection, and still do, for when an otherwise more serious setting slips in something incongruously wacky and surreal, even if it's as an easter egg of questionable canonicity. 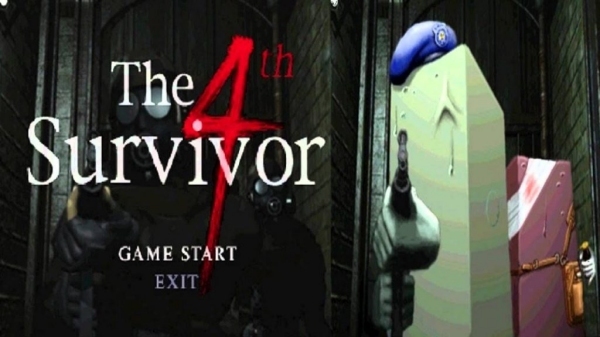 This particular game already does such a thing, as a matter of fact, with a secret post-game bonus scenario in which the player controls a block of tofu armed only with a knife, and I guess I expected Resident Evil to continue being a series with a weirder, zanier underlying streak to it. 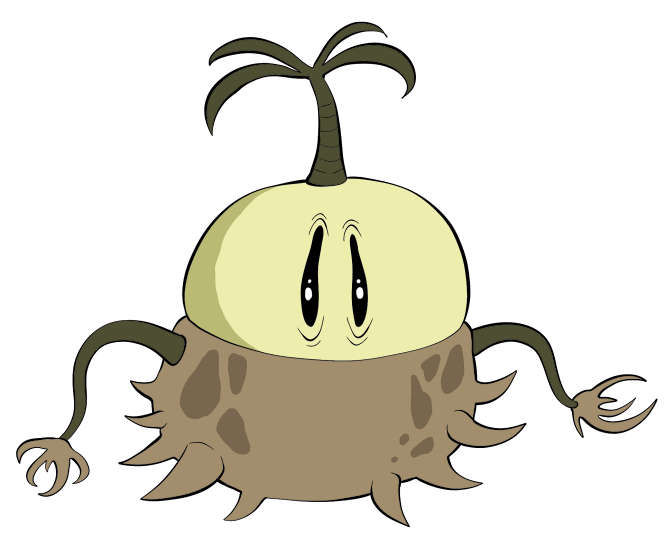 So, my original Umbrella Corporation experiment wound up looking like some sort of floating acorn with kirby eyes and a palm tree on its head, and I thought I was being pretty clever conceiving of a creature SO mutated it basically didn't even have the right aesthetic for its own game. I imagined there being only one of them, somewhere deeply hidden in Umbrella labs, with convoluted research notes that didn't seem certain what the hell this flying pineapple ever used to be. I didn't promise this would be great, mind you, or that it would preserve much of the original Flying Acorn, but here you go. An Umbrella product that was probably mutated from a ribbon worm larva mixed with who knows what else. Human and manatee? I just really want to see a monster in this franchise that emphasizes a sad, dopey, harmlessly comical appearance over a lethal one, because why should random mutations guarantee that something actually looks badass by anybody's standards? Why wouldn't there be pitiful, laughable mistakes for every scary Hunter and Licker? ...But would MALUNE be as pathetic as it looks, or deadlier than it appears? Like, you know, a hippopotamus?